This campaign focuses on the four LNG export proposals below. This project would be located 21 kilometres from the mouth of the Fraser River, next to the existing FortisBC liquefaction facility. It would receive 3.5 million tonnes of LNG directly from Fortis each year. Wespac wants to export LNG in tankers and bunker LNG-fuelled vessels using barges. Wespac proposes up to 90 tanker trips (up to 90,0000 m3 capacity) and up to 34 bunker barge deliveries (up to 7500m3 capacity) each year on the Fraser River. The project is currently under review in the BC Environmental Assessment Process. The proposed location for the terminal on the narrow, winding and heavily trafficked Fraser River navigation channel does not meet industry terminal siting guidelines. Application of hazard zone mapping to the terminal site and the LNG tanker transit route shows that key critical infrastructure (a planned jet fuel terminal and the future ten lane Fraser River bridge) are within the high risk 500 metre hazard zone for the project, as are residential complexes and first responder facilities. Portions of the communities of Steveston and Ladner fall within the 1600 metre hazard zone. Given the potential risks that this project poses to public safety, permitting and approval processes should be put on hold until BC and Canada develop a regulatory regime to mitigate security and safety risks. The campaign on this project is led by Voters Taking Action On Climate Change. This project would be located on the west shore of Saanich Inlet at the Bamberton industrial site. The proponent intends to export 6 million tonnes of LNG each year, resulting in 73 to 123 LNG tanker trips per year. Tankers would transit through Satellite Channel Ecological Reserve, through several BC ferries routes and fishing grounds. This LNG tanker traffic would place populated areas in Saanich Inlet and the Southern Gulf Islands within the 500 metre hazard zone. The proponent has not yet applied for an environmental assessment of the project. The liquefaction facility will require a natural gas pipeline from Cherry Point Washington across the Salish Sea. As Vancouver Island has insufficient electrical power to supply this proposal, it would likely be powered by natural gas, resulting in flaring and fugitive methane emissions. No details have been provided on the cooling system for the proposed facility. If it is water cooled, it will return water to Saanich Inlet up to 10 C warmer than normal. The terminal for the proposed facility would be sited over kelp beds that are nurseries to salmon and herring. Saanich Inlet is a fragile fiord that is being revitalized from previous industrialization. The proposed site for the facility is within an earthquake zone. Four villages of W?SÁNE? have declared they do not consent to any component of the proposal and have not been fully consulted on this project. The sites of the pipeline, facility, and portions of the tanker route will be in W?SÁNE? territory, to which they have right and title. The site of the proposed facility is at the base of Yos Mountain, a sacred place for W?SÁNE? Nation. The local economy relies on the high-tech, government, service-economy, farming and eco-tourism sectors. Three nearby municipalities have declared that they do not support LNG in Saanich Inlet. The campaign on this project is led by Saanich Inlet Network. Woodfibre LNG Limited proposes to construct and operate an LNG export facility on the previous Woodfibre Pulp and Paper Mill site located approximately 7 km west-southwest of the urban centre of Squamish, British Columbia. The facility would have a storage capacity of 250,000 m3 (114,000 tonnes) and would produce up to 2.1 million tonnes of LNG annually for 25 years, commencing in 2020-21, resulting in approximately 70-100 tanker transits annually. The project had received an environmental assessment certificate but is currently undergoing an amendment to its environmental assessment because of changes made to plans for the project cooling system. Before the project can proceed, Woodfibre LNG must meet 25 conditions as part of the independent Squamish First Nation EA. These are in addition to the 131 conditions attached to the Federal/BC EA approvals of October, 2015 and March, 2016, respectively. The Woodfibre LNG facility sits on two known thrust fault lines and the site has a history of slumpage into Howe Sound. Underwater noise and light pollution from LNG tankers, tugs, and the onshore liquefaction plant will affect salmon migration routes, herring, and marine mammals. The flare from the cooling system will affect migrating birds and endangered bats. Siting an LNG facility in Howe Sound violates international safety standards and best practices for siting LNG facilities and tanker routes. LNG tankers have a good safety record thanks to strict international guidelines. However, these are not being followed by Woodfibre LNG. Potential conflict between recreational boaters, ferries, and LNG tankers has not been adequately addressed. Unregulated LNG tanker traffic puts residents at risk. As LNG tankers transit Howe Sound and bunker in English Bay, there is a high-danger zone for 1,600 metres (as identified in the Sandia Reports) on either side of the LNG tanker. People within this zone risk death by asphyxiation, or death/injury by fire or explosion if an accident happens. Canada has no regulations for LNG tankers. Howe Sound / Atl’Kitsem is going through an ecological recovery after years of exposure to industrial pollution. Building a new industrial facility in this area will impede that recovery. The camp aign on this project is led by My Sea To Sky. China National Offshore Oil Corporation (CNOOC)-Nexen is proposing to construct the largest LNG export terminal in B.C., on Digby Island, 1/2 km away from the community of Dodge Cove, and 3 km away from Prince Rupert. 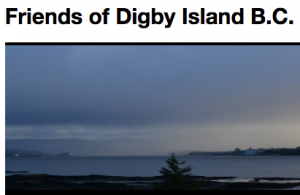 Digby Island is the island directly across from Prince Rupert on which the Prince Rupert Regional Airport that services the entire region is located. Aurora LNG will ship 24 million tonnes a year from the proposed berthing terminal at the entrance to Prince Rupert Harbour. The project will feature up to four trains for liquefaction of natural gas, storage facilities, power plants, up to three LNG loading berths, a marine offloading facility, a floating pioneer facility (400 men), 5000 man work camp, a pipeline and related infrastructure to bring gas to the facility. Q-flex (larger than standard) LNG tankers would be shipping LNG, up to 320 tankers per year, almost one per day. The LNG tanker berthing would be only 500 metres from the centre of the main marine navigational channel, putting all vessel traffic entering and exiting Prince Rupert Harbour within the Sandia hazard zones. The Aurora LNG project is still going through a BC Environmental Assessment https://projects.eao.gov.bc.ca/p/aurora-lng-digby-island/detail, a substitution for a federal environmental assessment. In April of 2017, Nexen asked for the Assessment of their application to be paused, not once but twice until May 30th. Possibly before the end of 2017, the BC ministers will have voted to approve or deny the Aurora LNG project. This project would require dredging sediment in the Skeena River Estuary which will release toxic dioxins and furans into surrounding waters. Exposure to these chemicals can result in a wide range of adverse impacts on wildlife and human health. Digby Island is home to many species of special concern, including nesting colonies of Great Blue Herons, essential habitat for the Western Toad, a nationally important Pacific Flyway for migrating birds and a DFO Important Area (IA) for Humpback Whales and other marine life, including Pacific Herring and salmon. Aurora LNG will burn approximately 7 million cubic metres of gas per day to process 97 million cubic metres of gas into LNG. This will have a direct negative impact on the Prince Rupert Airshed, dumping thousands of tonnes of harmful emissions on Dodge Cove, Prince Rupert, and other surrounding communities. Cumulative impacts for the already approved PNW LNG and the proposed Aurora LNG (both in the Skeena River estuary) is one of the areas of major concern. Aurora LNG is precedent setting because of its proximity to Canadian citizens and the human health impacts that would result from it. Pacific Northwest LNG is proposing to construct an LNG export terminal on Lelu Island – near the community of Port Edward – 13 km. south of Prince Rupert in northwestern British Columbia. The operation will have an initial capacity to ship 19 million tonnes a year of LNG to buyers in Asia. The project will feature liquefaction and storage facilities, a power plant, loading facility and a pipeline and related infrastructure to bring natural gas to the facility. Utilizing LNG tankers, shipping frequency would be about one vessel per day at full capacity, or approximately 350 tankers each year. Pacific Northwest is a consortium with majority ownership by Malaysia-based Petronas, which also owns shale gas provider Progress Energy. A new pipeline – the 48” Prince Rupert Gas Transmission project, would be built to deliver LNG to the project. The proposal has received environmental assessment certificates from both the BC and Federal governments. PNW LNG plans to make a final investment decision in 2017, with construction expected to take several years. Recent reports suggest that the company is looking to moving the LNG export facility from Lelu Island (subject to indigenous claims by the Lax Kw’aalams First Nation) to nearby Ridley Island. This project would require dredging approximately 1 million cubic metres of sediment from the Skeena River estuary which will release toxic dioxins and furans into surrounding waters. Exposure to these chemicals can result in a wide range of adverse effects to wildlife and human health. Lelu Island and its shoreline, which provides important habitat for juvenile salmon and other species, would be completely altered, putting approximately 30 million juvenile salmon at risk each year during migration and rearing. The project would also impact the most important salmon habitat on the west coast of Canada at Flora Bank. The project will require from 5 to 10,000 additional fracked gas wells in north east BC to supply “natural gas (methane) to the project. The supply pipeline to bring methane to the liquefaction facility on Lelu Island would cross over 1000 watercourses. Upon operation, this project would be one of the largest point source emitters of global warming pollution in Canada. The project will also generate impacts for the communities of Port Edward and Prince Rupert. The campaign on this project is led by Skeena Wild.